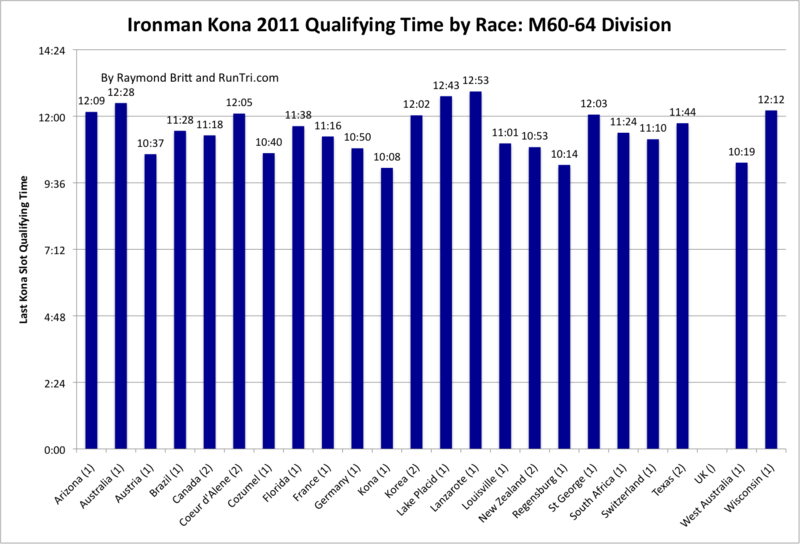 RunTri: Kona Qualifying Times and Slots by Ironman Race: Male 60-64 Age GroupQualifying Times (the last qualifying time to take a slot) and Slots per race (included in parentheses) for the Female 55-59 Age Group. For more, see our comprehensive analysis -- Qualify for Kona, Ironman Kona Qualifying Times and Slots, calendar of Kona Qualifying Races -- as well as our complete Ironman Kona coverage. Kona Qualifying Times and Slots by Ironman Race: Male 60-64 Age GroupQualifying Times (the last qualifying time to take a slot) and Slots per race (included in parentheses) for the Female 55-59 Age Group. For more, see our comprehensive analysis -- Qualify for Kona, Ironman Kona Qualifying Times and Slots, calendar of Kona Qualifying Races -- as well as our complete Ironman Kona coverage. Qualifying Times (the last qualifying time to take a slot) and Slots per race (included in parentheses) for the Male 60-64 Age Group. For more, see our comprehensive analysis -- Qualify for Kona, Ironman Kona Qualifying Times and Slots, calendar of Kona Qualifying Races -- as well as our complete Ironman Kona coverage.